Mini Goldendoodle Puppies: Is This Your New Best Friend? Mini Goldendoodle puppies have so many great qualities for your family! There are a lot of new and “designer” dog breeds around, but arguably the most popular and lovely is the Miniature Goldendoodle. This dog is a hybrid between a Golden Retriever and a Miniature Poodle. And let us tell you that these two breeds pack quite a punch when it comes to beauty and intelligence! It’s hard to know exactly what a designer breed will come out looking, more golden with straight hair? Or perhaps, smaller and with chocolate curls? The possibilities are endless and that makes each and every Mini Goldendoodle puppy unique and special! This breed was developed for people who have allergies. The golden retriever is a moderate to heavy shedder, while the Poodle sheds minimally and requires monthly grooming. This breed was also developed to create a compact, easy to carry dog perfect for people that are active and mobile. This is why it is one of the best breeds to keep if you travel a lot or if you live in a small space like an apartment. This breed is fairly active and will need daily exercise. A good routine is to take it to the park every day just to take a walk or a run. If you work out or do fitness outdoors, then this is the great companion dog for you. This dog is alert and will bark when there is an intruder. Mini goldendoodle puppies will bark or growl when there is someone new, but unfortunately, their size and general adorableness may not be enough to deter intruders. There has to be something they’re not good at! This dog is ideal for people who are new to owning and training dogs. This dog does not need much maintenance and trains quickly and effectively. It is the best dog breed for kids. It will adore children and will always play and be energetic around them. We love Mini Goldendoodle puppies so much that we always have them in our location! We also see so many happy families add another Mini Goldendoodle to their families or recommend them to friends and neighbors. If you’re interested in seeing all of our adorable puppies for sale, check out our available puppies page, right here! Bullmastiff Puppies for Sale: Spotlight on One of Our Gentle Giants! Our Bullmastiff puppies for sale are some of the cutest overgrown “lap-dogs” you’ll ever own! Looking for Bullmastiff puppies for sale? No wonder you are, this breed is one of the most powerful and commanding dog breeds out there. But the Bullmastiff’s size isn’t the only notable thing about them, they are also very intelligent and agile. Bullmastiffs want nothing but to be your loyal companion please you and your family. If you are up for a dog that is caring and very affectionate, even trying to snuggle in your lap despite their large bodies, then Bullmastiff puppies are the right choice. The Bullmastiff requires very little grooming maintenance because you don’t need to trim their fur. It just needs regular brushing to keep its coat clean and healthy. It’s a moderate shedder, but you have to remember it’s got a lot of fur! This breed needs patience with training and following commands, we suggest lots of yummy treats! A Bullmastiff makes a great watch dog. Aside from its intimidating size and height, this dog will bark and growl to deter any intruder. It will be loyal and protect its family at all cost. It is fearless to any aggressor. This breed is has medium adaptability, so it can live in an apartment or in a small area. However, like with any large breed, it still needs regular exercise and walks to keep it from packing on extra pounds or becoming bored and destructive. This breed is will be playful and friendly towards kids, but may be shy with strangers. It will be friendly towards other pets or animals in your home too. This breed has a powerfully built body, but despite this, they are considered very gentle. The Bullmastiff is loyal and will be a wonderful companion pet. We hope that a Bullmastiff may just be the best pet for you and your family! They certainly have a lot of love to give to the right owners. If you want to check out all of our Bullmastiff puppies for sale, just click here for our available puppies page! Shih Tzu Puppies for Sale: What Happens When You Have a Shih Tzu for a Pet? Who could resist Shih Tzu puppies for sale? That face is as cute as it gets! If you’ve ever known anyone who has owned a Shih Tzu, it’s probably a big reason why your considering picking that breed for a new pet! A Shih Tzu is a ball of pure adorableness and is known to be one of the most energetic and loyal pets. Here at Petland Kennesaw, we love this breed so much that we always have Shih Tzu puppies for sale in our store! We are committed to matching the right pet to the right family and meeting the needs of both and we consider the Shih Tzu a joy for all those families that take one home from us! This breed is small and compact, but will be willing to stand up to any competitor which is why it is called the “lion dog”. This breed is very loyal with a strong personality. An extrovert by nature, the Shih Tzu likes to be smothered with love and attention. This is a good dog breed for first time dog owners. Grooming could be costly, but rewarding as it does not have any dander is good for people with allergies or asthma. Its coat is flowing and very luxurious so it needs constant brushing to keep it in good shape. The shedding is also minimal. Shih Tzus can be quite a handful when training, but with a consistent training regimen it will retain commands very well. Training a Shih Tzu needs patience and perseverance, and often some yummy treats! Sometimes the best training is found through the stomach! This breed may be small, but it will watch over its family and owner very well. It will bark or attract the attention of its owner when there is an intruder. If you are not the active type, then this is the ideal dog for you. It does not need that much exercise, but you still need to take it out for walks on a regular basis. The Shih Tzu does very well in small apartments or condos. Shih Tzus are good with both children and older people, but we recommend that you expose your puppy to people, other animals and environments so it gets used to different situations. With all these great traits, it’s no wonder that the Shih Tzu has been one of the most popular small breed dogs for many years! 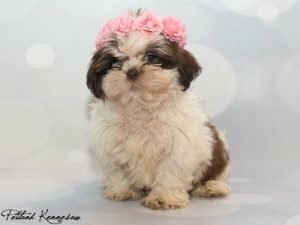 If you think that the Shih Tzu might be right for your family, check out all of our smushy-faced Shih Tzu puppies for sale on our available puppies page, right here! Yorkie Poo Puppies for Sale: Is the Yorkie Poo the Right Dog Breed for You? 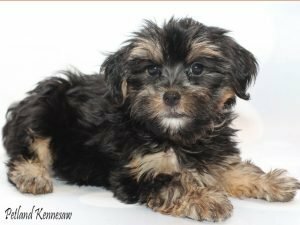 Yorkie Poo Puppies for Sale: A Lot of Cuteness in a Little Package! Gentle and cute, the Yorkie Poo is one of the most popular designer pet breeds for dog lovers. There are Yorkie Poo puppies for sale almost everywhere but the question remains, is this dog breed the ideal breed for you and your family? Here at Petland, we believe that the Yorkie poo can an ideal furry family member for many different types of people. That’s why we are always matching our Yorkie poo puppers with their furrr-ever homes in our store! Check out these Yorkie Poo traits and see for yourself if this is the ideal next pet. The Yorkie Poo is what’s called a “designer breed” and the product of a Yorkshire terrier and a Miniature Poodle. One of the main reasons was to eliminate the pet dander that comes along with dogs, so the breed would be better suited for people with allergies or asthma. This breed is very intelligent and can follow commands closely. It trains well, but needs consistency and a firm training hand. You must be patient, the Yorkie poo can be a saucy breed! Regular grooming is needed to keep its fur in tip top shape. It is the ideal pet for people who don’t want to deal with pet fur at home or in their cars. This is the ideal pet for first time dog owners, since it trains easily and needs only moderate grooming maintenance. Yorkie poos are good with kids. It will play with them, is energetic and affectionate. It is also good with other pets and animals at home. This breed is very loyal too and will do all it can to protect its owners despite its size. It can be depended on to bark or warn owners of intruders. This breed is all out fun! You can take it anywhere and does not need a large yard to play. It is suitable for people who live in a small house or apartment. A Yorkie Poo might just be the breed you have been looking for so take that leap and bring home a new friend! Check out all of our adorable Yorkie poo puppies for sale on our available puppies page, right here! Want more information? No problem! Give us a call today and our caring, knowledgeable Pet Counselors can answer any questions you might have about taking home one of our puppies! Rottweiler puppies for sale, there are few dog breeds that have such a commanding presence as the Rottie! Nothing could be as powerful as a Rottweiler. It is muscular, strong and very intelligent. 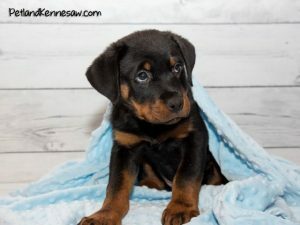 If you have been looking for Rottweiler puppies for sale, then you’ve got a great breed in mind for a new four-legged family member. This breed is perfect as a family dog and are very loyal to their owners. They excel in protection training, and as sweet as they really are, their looks alone can scare off intruders! Here at Petland, we love matching puppies with their furrr-ever homes and so we have become experts in every breed! We want you to have all the information necessary when you decide to bring home a new puppy so everybody stays happy and healthy! The Rottweiler is powerful and strong, but also very loyal. You can bet that this pet will do all it can to protect you and your family. It will bark if there is an intruder and will warn you of any danger. It’s important to expose your Rottweiler puppy to different animals and environments so they can become accustomed to these things as they get older. A Rottweiler is popular as a police and military dog in many different countries around the world. It has a powerful nose and can be trained to do almost anything for their owners. Because of their size, Rotties need to be given high quality food. That’s why here at Petland, we only feed and recommend Health Extension brand dog food! A Rottweiler is muscular and will need regular exercise. You must take it for a walk or a run for at least an hour a day. They tend to be lazier when they get older, which can cause weight gain and obesity, so it’s important that their owners keep them active. Rottweilers are easy to train and are able to pick up commands with ease. They are ideal for both experienced and new owners. We believe that the Rottweiler is one of the best family pets out there. Despite their somewhat forbidding looks, they are very sweet and lovable and do great with children of all ages. Want to check out our adorable Rottweiler puppies for sale? Just click here for our available puppies page! Pomsky Puppies for Sale: Things You Might Not Know About this Precocious Breed! Are you searching for the perfect Pomsky puppies for sale to take home to your family? 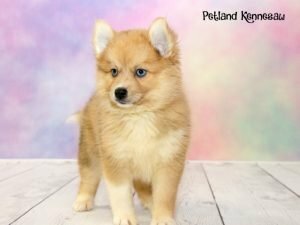 If you are thinking of getting a new furry family member and you have your heart set on Pomsky puppies for sale, then you have a good eye for dog breeds! Not only are Pomskies extremely popular these days, but they make great pets for both seasoned and new dog owners. And, I mean, have you seen those beautiful eyes? Just looking at a Pomsky would make you melt! But cuteness isn’t everything, you have to make sure that this rambunctious breed will fit in with your family. A Pomsky is a cross between a Pomeranian and a Siberian Husky. Hence, it is a mixture of the compact and energetic Pomeranian and the sturdy and strong Husky. It’s two for the price of one! Because a Pomsky is part Husky and Pomeranian, it is very energetic and playful and thus it needs quality food that will support its nutritional needs every day. Here at Petland, we are proud to feed and recommend Health Extensions brand dog food, a family owned and operated company out of New York! A Pomsky is very intelligent and therefore will respond really well to reward training. However, Pomeranians tend to be a stubborn breed, and therefore an owner should be patient and calm in training a new puppy. This breed does not need regular grooming like a Pomeranian, but it still needs regular brushing to keep its fur clean and shiny. If the coat gets matted or snarled, it might be a good idea to have them professionally groomed. This breed has few medical issues, but could suffer from dental problems such as build-up of plaque. A Pomsky needs regular dental checkups. A Pomsky has to be taken for regular walks to get adequate exercise. If you are an active owner and you exercise often then this is the breed for you. Here at Petland, we always want to match the right pet with the right family and make sure everyone’s needs are met! If you’ve got more questions about our Pomsky puppies for sale, please don’t hesitate to give our knowledgeable Pet Counselors a call. Think a Pomsky is definitely the puppy for you? Check out all our Pomsky puppies for sale on our available puppies page, right here! Miniature Schnauzer Puppies for Sale: This Dapper Little Fellow is Feisty! Why You Can’t Go Wrong with Miniature Schnauzer Puppies for Sale! They Are One Saucy Little Breed! If you are looking for Miniature Schnauzer puppies for sale, we urge you to stop what you’re doing and find out more about this adorable breed before you make your purchase! This breed is small and has originated in Germany. It was developed from a standard Schnauzer to a smaller dog breed like an Affenpinscher or a poodle. This dog is agile and very efficient despite its size it is active and is perfect for an outdoorsman. Be sure to check the traits of this dog breed, so you know what to expect when you take home your new little ball of fluff! It has one of the most elegant furs which only require moderate maintenance. You need to groom it to keep its coat clean, shiny and healthy. It is easy to train and will listen to commands intently. You don’t need to repeat your commands again and again when training this breed. The Miniature Schnauzer is perfect as a watchdog. You can count on this dog to bark and alert its owners for intruders and strangers. It is small but it will protect its owner and its family against danger. This dog is suitable for apartment living since it does not require a large yard to move about. It still needs regular exercise to keep it in tip top shape. This breed will handle cold and warm weathers and thus it can live almost anywhere. This breed is very friendly witch children and will be able to live with other pets and animals at home. This breed could be handled even by inexperienced owners because it is very easy to train. Miniature Schnauzers sound awesome, right? We think so too! That’s why Petland always has these regal little guys in our store! 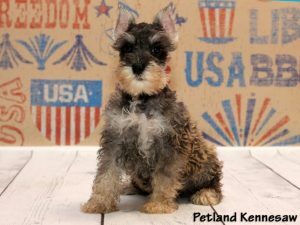 If you’d love to own one and can’t wait to have one, then it’s the best time to check out our Miniature Schnauzer puppies for sale on our available puppies page. 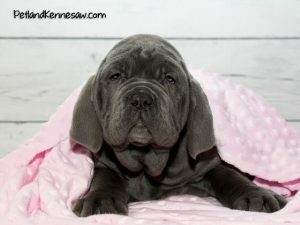 Mastiff Puppies for Sale: So Many Gentle Giants to Choose From! Mastiff Puppies for Sale Can Come in Many Different Shapes and Sizes, Read Along for More! 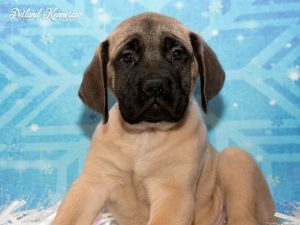 Looking for mastiff puppies for sale? Mastiffs are a large breed of dog which is thought to be the ancestor of breeds like the Alaunt, Britanniae and the Pugnaces. This breed is huge with a trademark large head and black face. The English Mastiff is a gentle giant; it is the largest dog breed when it comes to mass. There is also the Dogue de Bordeaux, which is the French Mastiff. And there is also the Bullmastiff, the American version and the Cane Corso, which is an Italian Mastiff. And last, but not least, the very recognizable Neapolitan Mastiff! This breed does not require regular grooming. It requires little to no stripping or trimming too. This dog is very intelligent, but you need perseverance and patience to train it regularly. It is the ultimate guard dog since it will bark to warn its owners and intimidate an attacker. Its massive size makes it look very powerful and most of all, it is loyal and will protect its owners no matter what. Despite its size it can live well in an apartment and will not require a yard to live. You must therefore encourage it to walk, run and play to keep it healthy and maintain its weight. But if you do not exercise and prefer to simply sit back, relax or read a book then a gentle mastiff is the right dog companion for you. This breed is for people who are experienced and willing to train and maintain a powerful dog. Finally, it is very good with kids and with other house pets. It will play with children and will protect them. Some mastiffs are shy and aloof when it comes to strangers. Is your head spinning yet on all the different kinds of Mastiff puppies? Don’t you worry! Our dedicated, knowledgeable Pet Counselors can help steer you in the right direction of the Mastiff puppy best for you. While Mastiffs all have similar characteristics, there a definitely subtle differences that can make one breed more perfect for your family. Click here to visit our available puppies page to see all of our Mastiff puppies for sale! 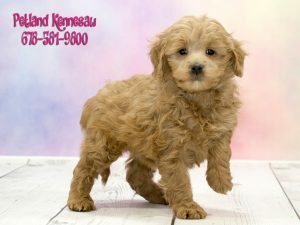 Cockapoo Puppies for Sale: This Little Ball of Fluff is Full of Love! Our Cockapoo Puppies for Sale Are Fluffy, Playful and Ready to Go Home with You! 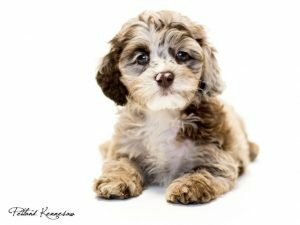 Are you looking for cockapoo puppies for sale? If you are then you must first learn more about this unique breed and its amazing characteristics before you purchase one. A cockapoo is a cross between an American or English Cocker Spaniel and a poodle. The result is a loyal, active breed that has very low-shedding tendencies. Cockapoos are available in different colors: black, tan, red, silver, brown or while or it could be a mixture of all these colors. Cockapoos are perfect hunting and retrieving dogs. If you love the outdoors and you hunt for game then this breed is the best companion. It looks like a delicate dog but it’s not. This dog prefers to be outdoors rather than being in a salon for grooming! This dog requires regular grooming to keep its fur in tip top shape. You may need to keep it trimmed and stripped to maintain its healthy coat. The cockapoo is easy to train and is capable of learning many different commands. This breed could live in an apartment, since it does not need a large yard. But it still needs to get a good run in each day. This breed is fairly active and therefore needs regular exercise. It is the right breed for people who love the outdoors. Visits to the dog park may be the best idea. If you have children, then this dog will love to play with them and keep them entertained. It will also work well with other pets and dog breeds. This dog will bark if there is an intruder and thus is also a good watchdog for their owners. Now that you know all the wonderful qualities of a cockapoo then it’s time to check out all our adorable Cockapoo puppies for sale on our available puppies page! Or give us a call today if you have any questions or are looking for something special! Beagle Puppies for Sale, This Hound Dog Will Steal Your Heart! If You’re Looking for Beagle Puppies for Sale, Look No Further! Are you looking for beagle puppies for sale? If you are then this guide will help you get to know this breed a little better. A Beagle is a dog breed with a small to medium-sized body, with a compact appearance and shorter legs. This dog is a member of the AKC Hound Group and often competes and excels in agility courses. Beagles have awesome sense of smell and are highly intelligent. Beagles are easy to groom and do not require trimming or stripping. You must be patient when teaching a beagle tricks, it takes time and consistency to learn commands. Beagles are perfect watchdogs and will bark and will alert owners when there is an intruder. They are very protective of their families. This dog is fairly active and will need regular exercise. This is a breed that will let you enjoy the outdoors, like hiking, biking and running. This breed is ideal for people who are taking care of dogs for the first time. It won’t require a lot of maintenance as long as you are an effective trainer. Beagles are very affectionate towards children and are very energetic and playful. You can also bet that a beagle will live in harmony with other pets. Beagles are naturally healthy and do not have any inherited health conditions. Beagles are very intelligent and can be trained to do all kinds of things; it is one of the most popular service dogs. All of these wonderful traits make this dog breed one of the most sought after, especially for families. 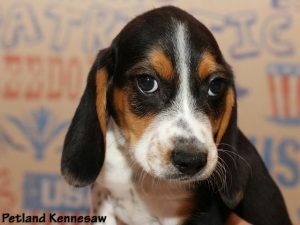 So if you’re eyeing beagle puppies for sale, make sure you check out our available puppies page! Or come by the store to see our Beagle puppies in person today!